A chance phone call to Michael Vergers this morning revealed that he and Juan Barazi – and not the unfortunate de Castro / Burgueno pairing – are the 2006 Le Mans Series LMP2 Drivers Champions. No it wasn’t. Apparently, the Le Mans Series’ own rules stipulate that drivers switching teams (or team names) cannot carry their points with them, so the 10 points scored for the win at Spa (where Amaral didn’t complete the minimum time in the car anyway) don’t count – although they do in a way, because de Castro and Burgueno feature twice each in the points table now, once in car #40 (20 points) and once in car #39 (10 points). Has a points table ever featured drivers appearing twice? That title was awarded to Barazi-Epsilon after Jarama – but now the two regular drivers in the #32 Courage C65 AER are the drivers champions too. “We had our fair share of issues during the season, but we finished every race,” adds Vergers. The RML MG Lola was about to finish every race too – until six minutes from the end at Jarama, when Tommy Erdos, without warning, had the rear wheels lock up on the EX264. “I coasted downhill, but I still had the uphill section to go, and with no power, that was it,” explains the Brazilian – still desperately disappointed, obviously, at losing out on a Le Mans (Endurance) Series championship, at the last race, again. At least he and Mike Newton won Le Mans twice. So three wins for the yellow Lola, one for the red, white and blue MG Lola and one (Istanbul – a story told here) for the blue and red Courage, and Barazi-Epsilon, Juan Barazi and Michael Vergers are the LMP2 champions. 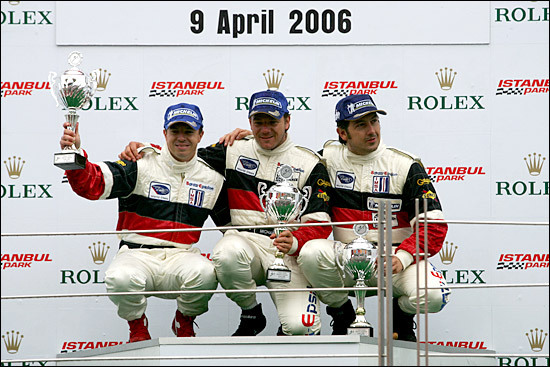 Here they are, with Jean-Philippe Belloc, on the podium at Istanbul in April. Vergers is in Monaco for a six hour (three times two hours) kart race this weekend, “with Matt and Duncan – I only met them this morning”, and then he’s off to California next week, to drive the Bruichladdich Radical, with Stuart Moseley. Expect Moseley and Vergers to be a very potent combination at Laguna Seca, as they take on the RS Spyders, the Intersport Lola and the van der Steur Radical.